Since 1984, Burt's Bees has been working with nature to create products that nurture your skin. We believe that pets are family, so we're bringing the same natural attention and care to you closest furry friends. 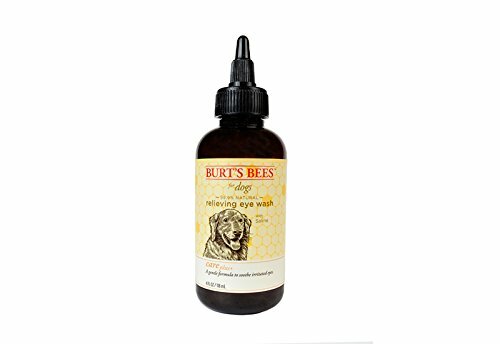 Burt's Bees Relieving Eye Wash uses a gentle formula to soothe and cleanse you dog's irritated eyes. Directions: Apply 2 or 3 drops to your dog's eye to clean out debris. Store in a cool, dry place. Ingredients: Water (eau), glycerin, sodium chloride, benzalkonium chloride, citric acid. Warnings: Safe for dogs 8 week of age or older. Keep out of reach of children and pets. If you have any questions about this product by Burt's Bees for Dogs, contact us by completing and submitting the form below. If you are looking for a specif part number, please include it with your message.